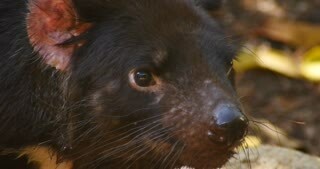 Search Results for "tasmanian devil"
Tasmanian Devil, sick from devil facial tumor disease cancer. Cute but aggressive and powerful carnivore, the Tasmanian Devil, Sarcophilus harrisii, is an endangered species. Disease threatens the animals in the wild. Close up view of marsupial walking. Lazy, tired Tasmanian Devil sniffs the air while laying on the ground near a log before putting its head down and going to sleep. 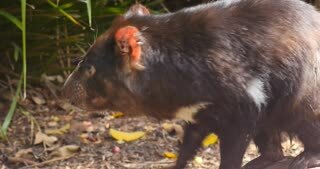 Tasmanian devil runs to top of a small mound and finds a chunk of meat that has been placed to feed it. Conservation of an endangered species. Slow motion. 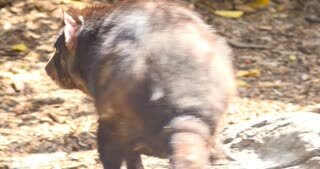 Close up view of a Tasmanian Devil, Sarcophilus harrisii, sniffing the air trying to locate food. Small carnivorous marsupial known to be aggressive with large powerful jaws and teeth. A Tasmanian Devil, Sarcophilus harrisii, chewing on a piece of meat and bone is the largest carnivorous marsupial in the world. Endangered species suffering from natural disease. Tasmanian Devil sniffing the ground searching for food. Small black carnivorous marsupial is an endangered species. Conservation efforts to create a healthy population free of cancer that is killing. A tasmanian devil sleeping in the afternoon sun near tall grass. Small black carnivore is an endangered species and protected by law. Tasmanian Devils viciously tear into prey in a feeding frenzy.